Blogging for Books, Patrick Di Justo, This is what you just put in your mouth? In recent years, a movement to "eat clean" and limit the number of processed foods in the average diet has gained momentum. The implication is that processed foods contain all sorts of unhealthy ingredients that we would be better off without. 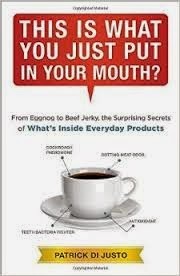 The book This is What You Just Put in Your Mouth?" breaks down everyday products to discover just what is in them. The book is made up of columns that originally appeared in Wired magazine. In the preface to the book, the author, Patrick Di Justo, discusses how he first attempted to contact the manufacturers of the products to get their input on the articles. Many of the larger companies were understandably suspicious of his motives and didn't want to cooperate. Other companies were thrilled to have their products featured. Any publicity is good publicity, right? There are two sections, the first covering edible/consumable products, and the second household products. The food section even gives the reader the low-down on Alpo. The individual ingredients are then examined to determine what part each plays in the overall make-up of the item. Also, each product usually has a "backstory" which discusses the author's attempts to get the information about the product or further explains things like the history of the product or (in some cases) the more unpalatable aspects of the product (for instance, chocolate covered cherries contain enzymes that "pre-digest" the liquid center for you). Still, most of the ingredients, while not sounding exactly appetizing, also don't sound particularly dangerous, either. Naturally, most of the food products have added sugar, salt and fat to make them tastier (and probably more addicting). I was really surprised to read that Enfamil baby formula contains an ingredient designed to "jump start" infant immune systems. While this probably occurs naturally in breast milk, it was something I wouldn't have thought of as being part of the formula. This book is full of interesting information (and the occasional snarky aside) which makes it enjoyable reading rather than a dry recitation of facts. For instance, the author points out that protein deposits on contact lenses can "cloud your vision like a snot cataract." As a contact lens wearer, I can appreciate the comparison (even if it does make me wince a bit!). One thing I learned (rather to my alarm) is that the aluminum in most deodorant products works by causing the pores of the underarm to swell shut and stop sweat from coming out. So the non-food entries ended up being more disturbing for me! Overall, I really enjoyed reading this book and finding out just what big companies are adding to their products.